They can’t all be Instagrams. Conceding defeat -- and citing a lack of user interest -- Facebook has decided to shutter FriendFeed. Facebook paid nearly $50 million for FriendFeed in 2009 -- two years after it was founded by some former Google engineers as a way for users to keep track of friends’ activity across multiple social services. Yet it was almost immediately clear that FriendFeed’s decision to sell out had sealed its fate. Just months after the deal was announced, traffic to the site had plummeted. 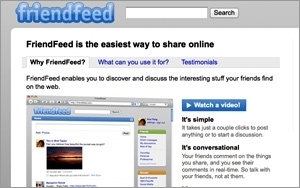 FriendFeed was conceived by Paul Buchheit, who built the first versions of Gmail and AdSense. It was part aggregation tool -- bringing in information from around the Web -- part public conversation, and part publishing tool for original content. The service aggregated feeds from different social networks, while allowing one’s FriendFeed friends to easily engage across networks. Among other issues, critics like Michael Arrington never thought the service was intuitive enough to achieve mass-market penetration. FriendFeed is officially expected to turn the lights out on April 9. Re/Code first reported the news on Monday.